Gisele Paquette of Gingham Wisdom is running a canning event on Sept. 12 that will teach participants how to make the New Brunswick specialty. Winter isn't far off, so it might be a good time to get the pantry filled up. Gisele Paquette of Gingham Wisdom is running a canning event on Sept. 12 that will teach participants how to make Lady Ashburn pickles. 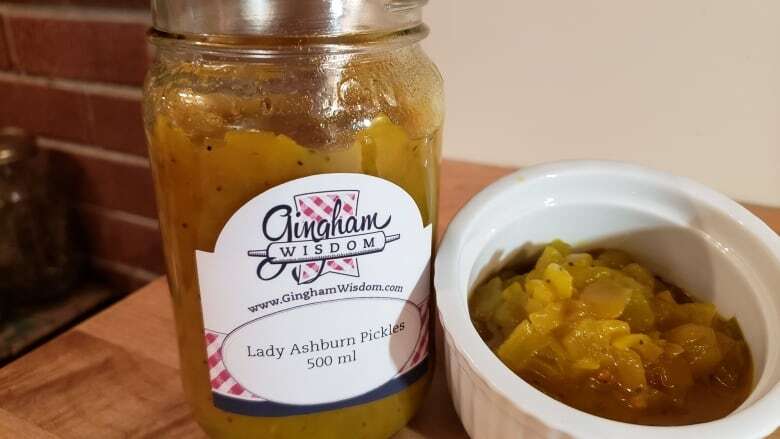 The pickles, which also go by Lady Ashburnham or simply Lady A, are a New Brunswick specialty and are connected to one of the province's historical figures. Thomas Ashburnham was a retired British soldier sent to the province by his father. There he met and then married Maria Anderson, a local telephone operator, in 1903. When Ashburnham's father died, he became an earl and she became Lady Ashburnham, and eventually gained a degree of fame for her mustard pickles. Paquette said when she came to Ottawa, she was surprised to learn the pickles hadn't travelled beyond the province. "I was so surprised that no one had them in their pantry or their fridge," she told CBC Radio's All In A Day. "I learned the history and learned how regional they really are." 6 large cucumbers, peeled and with seeds removed. 4 cups of onions, thinly chopped. 2 1/2 cups of vinegar. Place sliced cucumbers and chopped onions into glass dish and sprinkle with salt. Place heavy plate on top and let sit overnight. Next morning drain liquid from cucumber and onion mixture and rinse off salt. Place in large pot and add remaining ingredients. Cook over low heat for 45 minutes to one hour while stirring often. Bottle in hot sterilized jars leaving headspace. Process in hot water bath canner for 10 minutes. Detailed instructions can be found here.